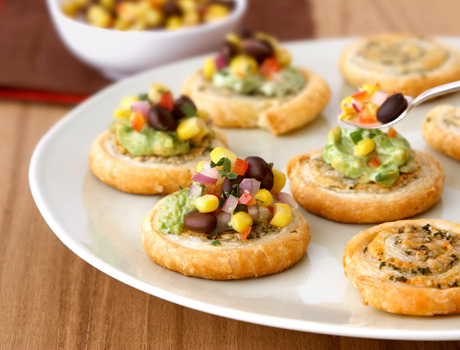 Set the bread aside...our kicked-up bruschetta topping, made with corn, beans and peppers, is served on cheese filled puff pastry. Yes, it is as good as it sounds! Unfold the pastry sheet on a lightly floured surface. Brush the pastry with the egg mixture. Sprinkle with the cheese and cilantro to within 1/2 inch of the edge. Starting at a long side, roll up like a jelly roll. Press the seam to seal. Cut the pastry roll into 20 (1/2-inch) slices. Place the slices, cut-side down, onto 2 baking sheets. Bake for 15 minutes or until the pastries are golden brown. Gently flatten the hot pastries with a spatula. Let the pastries cool on the baking sheets on wire racks for 10 minutes. Stir the corn, beans, onion, red pepper, jalapeño pepper, cumin and 1 teaspoon lime juice in a medium bowl. Mash the avocado in a medium bowl. Stir in the sour cream and remaining lime juice. Season with the black pepper. 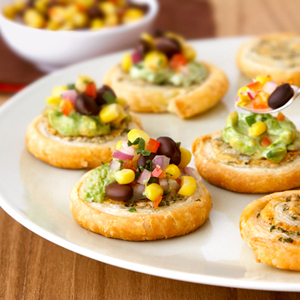 Top each pastry with about 2 teaspoons avocado mixture and 1 tablespoon corn mixture. Top with additional fresh cilantro, if desired.